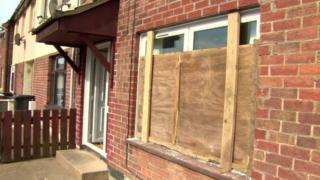 The publicly funded housing body "accepted" a total of 2,060 cases but rejected about 1,000 of the complaints. The Detail said the "overwhelming majority" of the accepted cases were in eastern parts of Northern Ireland, including Belfast; Lisburn and Castlereagh; Ards and North Down and the Antrim and Newtownabbey council areas. The Housing Executive agreed to buy 57 properties from homeowners who were forced to flee, at a total cost of more than ?6.7m.The sales are processed through the Scheme for the Purchase of Evacuated Dwellings (SPED).The housing body also paid emergency accommodation grants to more than 1,000 tenants who fled from rented homes, which meant an additional bill of more than ?800,000.Almost three quarters (1,523) of the accepted complaints related to paramilitary intimidation.A significant number (222) of householders fled due to what was described as "anti-social behaviour".Sectarian intimation forced 153 people from their homes and racism was cited as the motive in 112 cases.The issue of housing intimidation hit the headlines in September, when four Catholic families fled their homes in Belfast's Cantrell Close. PSNI Chief Constable George Hamilton said the victims had been forced to leave their homes "because of their community background, because of their religion".He said detectives believed members of the loyalist paramilitary group, the Ulster Volunteer Force (UVF), had issued the threats.In recent years, PSNI officers have also been the victims of housing intimidation.In June, the BBC's Nolan Show reported that every year, an average of 16 police officers either move home or have special security measures installed at their house because they are under threat.Deputy Ch Constable Drew Harris told the programme: "We could expect every month one or two officers to be in the position where they're having to move home. "The Detail asked the PSNI for its figures on the number of arrests and charges it has recorded for housing intimidation and SPED cases over the past five years.The website said the request was refused on grounds of how much it would cost of compiling the figures.The conviction statistics - 32 between March 2011 and August 2016 - are therefore based on figures obtained from the Northern Ireland Court Service.